I have become an astronomer member at Slooh and am able to reserve slots with objects of my choice on the Slooh telescopes which are situated on the Canary Islands and in Chile. Slooh members were given the challenge to do a Messier Marathon over the course of one night! 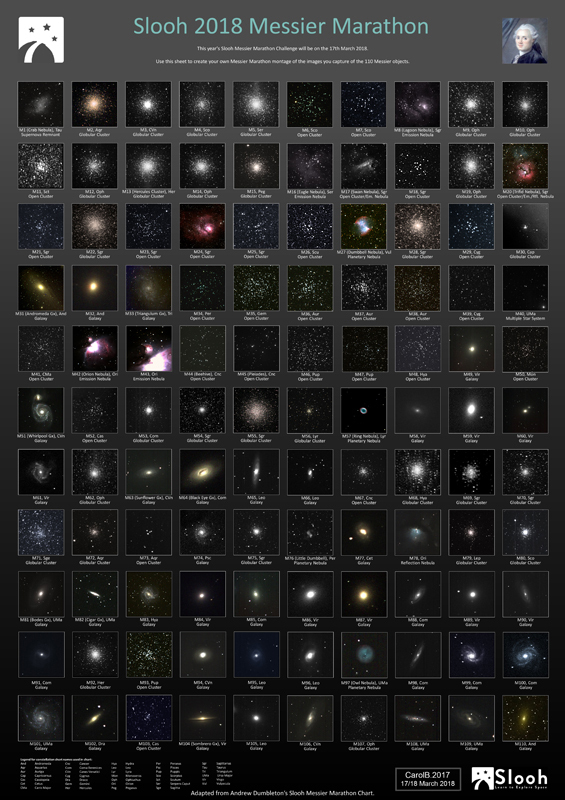 – we had to target all 110 deepsky objects in Charles Messier’s catalogue. The targets were divided between members and Slooh. Members are able to take images of all the objects on which the telescopes are focussed at any given time whether you reserved the slot or not. Then came the downloading and processing of all 110 images. The template was provided by Slooh, originally designed by Andrew Dumbleton and modified by Paul Cox. Processing: some sharpening here and there where stars were really “runny”, some filters on the open clusters to give a more varied appearance and finally cropping to fit into the tiny boxes. The quality on some of the shots are an indication of the high wind gusts that the domes had to withstand on the night. The very best yet also the worst image is M30. 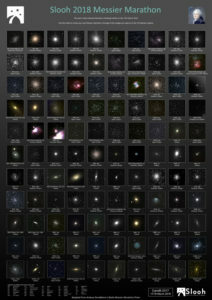 It was touch and go or we would not have been able to complete the entire catalogue. M30 was just 3° (I think) above the horison and our one and only chance to get the image. This has not been a walk in the park challenge but so rewarding. I can’t believe I’ve completed a Messier Marathon. Note to my deep sky mentor, Auke Slotegraaf – at least I did not try to sketch these 😉 but then it would have earned me an Astronomical Society of Southern Africa Certificate – that’s for sure!